* Improve the size control. The basic idea of the methods is plastic deformation of material by applying a relatively small force so that a hardened layer on the surface exists. Roller Burnishing, Shot Peening, LPB (Low Plasticity Burnishing) are such methods. If relatively small force is applied using a highly polished roller, which has the translation and rotation actions it will follow a path through the metal surface. This case is called Roller Burnishing operation. The principle of Roller Burnishing is transferring the force applied on a roller to the surface in a certain path. During the rotation action the contact area is so small that hertz type pressure occurs on material surface (like roller bearings). This provides low energy and rolling force requirement. Roller Burnishing a metal surface is only possible with specially designed rollers and mandrel - roller combinations. Figure-1 presents a pattern diagram of roller burnishing process for a spherical roller. The first contact to the machined surface occurs in Section (A). In section (B) the yield point of the surface is exceeded and plastic deformation takes place. Pressurized depth can be seen here as (D). 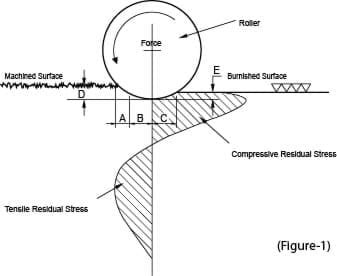 After the material has been subjected to the maximum compressive strain, in section (C) it begins to elastically relieve (E) through the finishing zone finally leaving with a smooth surface and a compressive residual stress of significant peak value. The stresses formed on the material during the compression decrease towards the center. These stresses reach approximately 1 mm. below the surface increasing surface hardness as a result. ROBUTO® tools comprise a mandrel and rollers placed in a slotted cage. This design provides sizing with high dimensional accuracy. * 30% - 70% increase in Brinell Hardness on surface.